Optoma Nuforce BE6i – Is It Time To Ditch Those Pesky Wires? So right off the bat I have to confess that I’m not the biggest fan of wireless. Every computer in my house is wired to my router, every pair of headphones I own is wired and my past experiences of Bluetooth didn’t exactly persuade me that it’s time to ditch those pesky wires. Infact besides a cool little BT speaker I bought, my experience has actually been pretty shocking. Constant connection interruptions, poor battery life, annoying loud and heavily compressed Chinese vocal prompts that deafen you and the worst offender of all was noise. A little BT receiver I bought had so much noise that you literally had to listen at uncomfortable levels to drown the horrible electrical noise being pumped down your ear canal. We recently had a sample pair of Airpod wannabes for us to test in the office and they were catastrophically bad. And that was that, Id had enough of this technology and the “wireless audio revolution”. With all that in mind, I’m a little surprised at what I’m about to say…The Optoma Nuforce BE6i have become my weapon of choice for commuting to work, listening to music in the office and watching movies and TV shows at night. So what has brought about this change of heart? Let me tell you! The BE6i’s are available in 2 colour schemes and come in a really nice looking package with a lovely selection of tips and clips including 5 pairs of custom designed silicone tips. The inclusion of 2 pairs of Comply tips (Medium and Large) is a bonus for me as I’m an absolutely massive fan of them and they also help keep the heavier than usual earphones to stay in while you’re on the move. Optoma have also included a high-quality hard case to protect your earphones which is a welcome touch. They support aptX and AAC codecs for best quality on all your devices. The earphones themselves are understandably chunky, have a nice aluminium finish, 10mm drivers, they come with a flat, tangle-free cable and an in-line remote that strangely doesn’t quite match the finish of the rest of the product. Aesthetics aside, the remote works perfectly even in torrential rain! 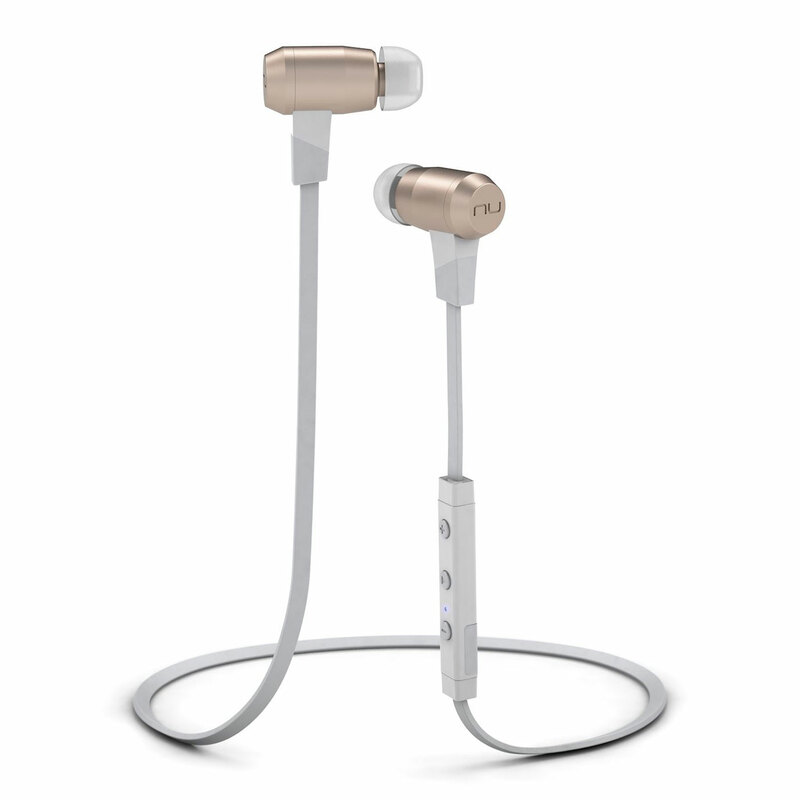 The BE6i are also IPX5 water resistant which is quite a high rating, especially useful in England. They connected to all devices I tried them with – Android phones, an Ipad, multiple USB BT dongles without any problems – the BE6i will also store up to 8 seperate device connection settings! The battery life is outstanding too, Optoma state up to 8 hours and I can confirm this isn’t a pie-in-the-sky number as they seem to last forever. So how do they sound? Well, there is absolutely no inherent noise which was the first thing I noticed and one of the most important things I was listening for. The BE6i’s have quite a flat sound signature which may disappoint bassheads but with some EQ you can remedy this and the earphones will pump out the extra bass without deteriorating into an awful mess. The very top end of the treble region seems to be slightly clipped but this I imagine is at the mercy of the aptX protocol rather than a limitation of the earphones, The stereo seperation is there, the soundstage is wide enough for in-ears though depth does suffer a little and the midrange vocal region is probably their strong point. These will probably be more of a hit with rock lovers, the sound signature definitely leans in that direction and doesn’t disappoint when listening to Trent Reznor scream on NIN – Terrible Lie! In conclusion, against expectations, I really like these earphones. Do they hold a candle to my favourite wired setup – no they don’t, but there was no expectation for them to do so. Have they replaced my go-to wired setup for the commute to work and in-office listening – yes they have indeed. They sound good, they’re weather proof, they don’t get caught on things, they do what they are supposed to do and they do it very well! They have also made it possible for me to watch TV shows in bed without annoying the hell out of my neighbours or dealing with my crazy dog jumping up and ripping my earphones out. Unfortunately some of the problems inherent to Bluetooth have still not been rectified such as audio delay. This makes them useless for gaming imo, although the delay can be compensated for from within KODI (ahead by 0.100s works for me) so watching movies and TV shows is fine. They also play ball with Waves NX which is another bonus for me. If you’re looking for a pair of Bluetooth in-ears then you should definitely check these out, just be aware that some of the limitations of the technology have not been overcome yet. Otherwise I’m pretty confident in recommending these earphones and also happy to announce that they are on sale at the moment too so theres no better time than the present to give them a try. Reduced from £99.99 to £79.99 for a limited time! 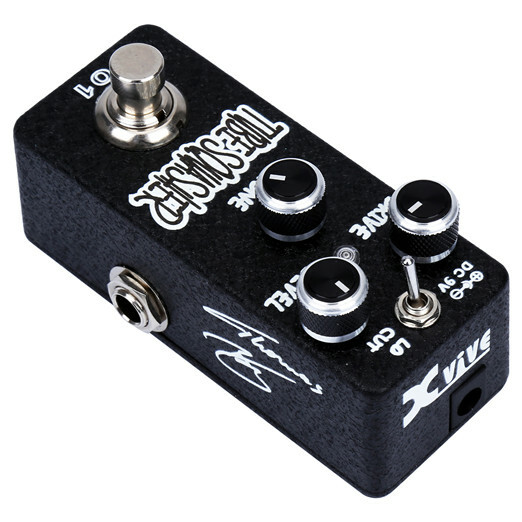 For those of you unfamiliar with the Xvive range of pedals, I’ve waxed lyrical about them before, but essentially these are USA designed, Chinese made ‘Micro’ pedals that sound very, very cool and take up minimal room on your board. In an earlier post I talked about German guitar wizard and ‘Tone guru’ Thomas Blug. Thomas has recently teamed up with the guys at Xvive and helped them to voice 4 different pedals for their range, and as you would expect, each one brings a different but remarkably accurate variation on a classic amp tone. 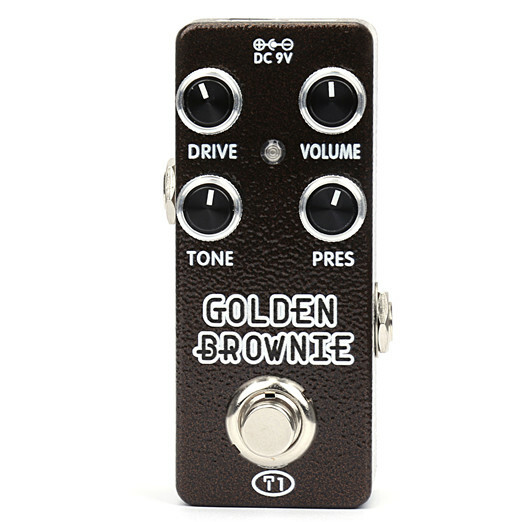 The first of these is the ‘Golden Brownie’, which is designed to give you the high-gain rock tones of the 80’s style Marshall sound, “Like a JCM800 in a box” is their claim. The sound is definitely synonymous with the classic British Rock tones of that era, and some judicious cutting or boosting with the Tone and Presence knobs can dial in quite a wide variety of transients to give you more or less of the Presence or Brightness required. The beauty of this type of in-expensive yet high quality pedal, is that even if you don’t play too much classic rock, it’s just a great tone to have in your palette, just in case you’re called upon to produce a minutes worth of Eddie Van Halen in the middle of your Country band’s set….. The Tube Squasher is a Low Gain sound, capable of big fat squashy tones, with a little compression to back it up. Add the Bass for a full on Jeff Beck fest, and it takes on an almost “Dumble-esque” quality. Lo-cut the bass, and you have a quintessential rhythm tone, with a sharp, Punky voice as well as a mature Rocky growl…. Again, even if you don’t use Classic tube amp tones in your day to day set, these little units are so inexpensive, it seems silly not to have at least one of these type of pedals in your armoury.. The word for this Overdrive unit is ‘Transparent’. Your original tone shines through without being masked or shaped which immediately marks it out as being a fantastic rhythm pedal, but it can also conjure up the sound of an old tweed amp being pushed through its paces. Indeed it has a ‘Growl’ knob, specifically to control this. 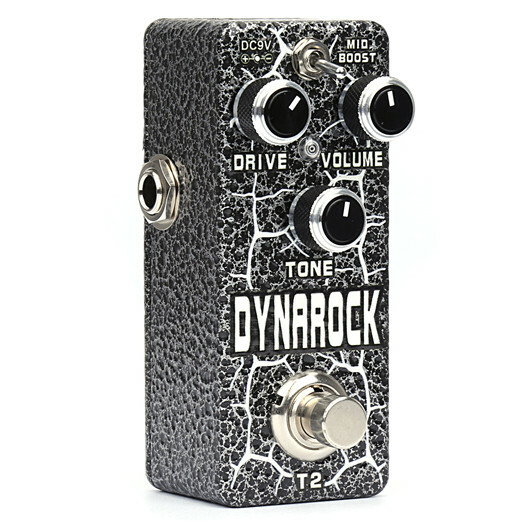 So if you want a lovely Clear Bell like overdriven tone or indeed to spit out a little more broken up venom, this could very well be the pedal for you. This pedal cuts through with a lot of clarity, no mushy tones here. However, it also features a mid- boost that can deliver a lovely full fat tone, perfect for those fusion-y legato players. Ableton introduce their bitesize creative tips series “One Thing”. It seems to be the season for tutorial videos at the moment, although Ableton have chosen to move in a slightly different direction with theirs. Any artist can suffer from a lack of inspiration at some point and the videos in this Ableton bitesize series are designed to help kick-start your creative process, and in this respect share the same common goals as the popular ’74 Creative Strategies for Electric Music Production book they put out a few years back. The series launches with 13 videos and promises to bring you a new one each month to help keep you inspired in the studio with technical tips as well as broad creative strategies, there’s something that should strike a chord with beginners and experienced musicians alike. Check out the Ableton “One Thing” series here. All things Ableton @ Scan. For anyone looking to get their hands on Steinberg’s WaveLab Pro 9, now’s the time! They’re currently offering 40% off until March 20th. 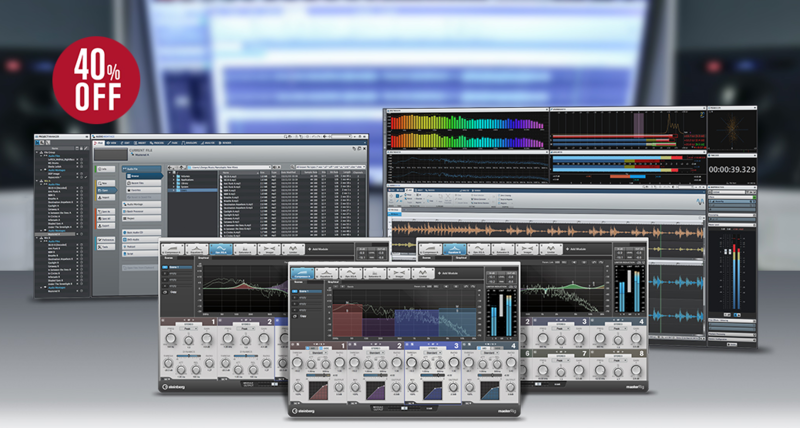 The offer also applies to upgrades from versions 6/7/8/8.5 and the upgrade from WaveLab Elements 7/8/9. Ok, I have to confess a bias here before I start. 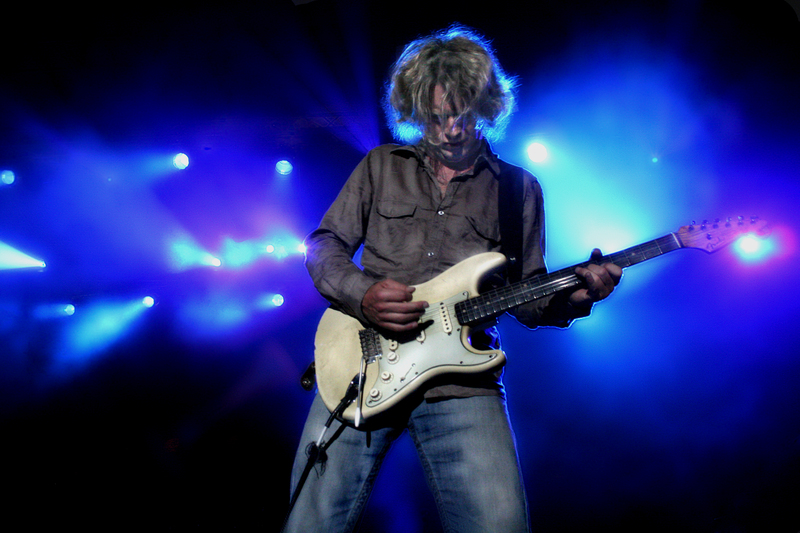 Thomas Blug is a German guitarist, who has for the last couple of decades, built a reputation for having one of the best Guitar tones in the business. He’s also been a mate of mine for a long long time. Later, the company I worked for, took over the distribution of Hughes & Kettner, and Tom and I worked together on sales and demo’s for the UK. So I know him as an old friend. I also know that he has 2 of the best ears in the business. This guy really does know about guitar tones. So when he announced he was coming to market with what appeared to be a pedal, I was intrigued. In fact it’s all amp. In fact it’s a fully functioning 100 watt amp head, that you can attach straight to a 4 X 12 cabinet and make a proper racket with. Light, Portable and efficient, yet capable of generating a full 100 Watts of blistering tone, this amp is at home either on stage or in the studio. The first time I heard it in the studio, I immediately removed all the other Amps, Amp sims, modelling units etc, because this, is the best I have ever used. 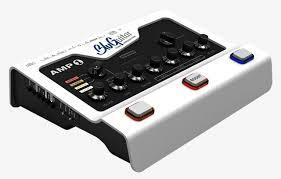 Don’t get me wrong, I love using my UA plug-ins for mixing down, but when it comes to tracking, there is nothing to beat a real amp. And remember, it’s not just for the studio, it sounds unbelievable live too. 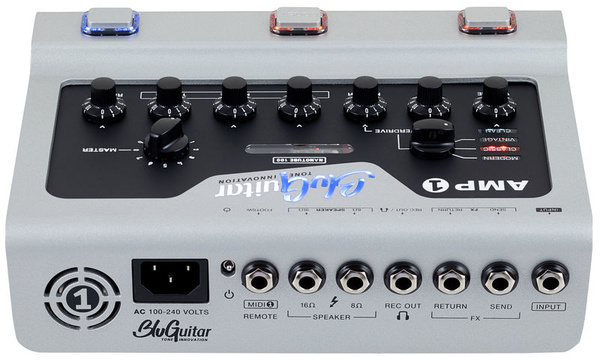 The Amp One features 4 configurable channels. Clean, Vintage Classic and Modern. 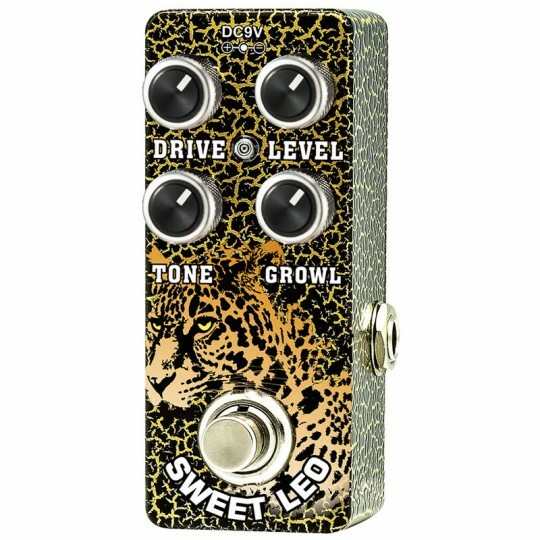 Each of these is switchable and has adjustable Boost and Reverb controls. The amp also features a Killer speaker simulation output for use in the studio as well as a headphone out. This tiny package, that can fit easily into Hand luggage or a gig bag, delivers a round, fat bass with crisp, non ‘tinny’ trebles and an overall tone that you’ll recognise immediately as that of a true modern, boutique amp. Why not give us a ring and arrange to come and demo one in our new ‘Blue Room’ demonstration suite. 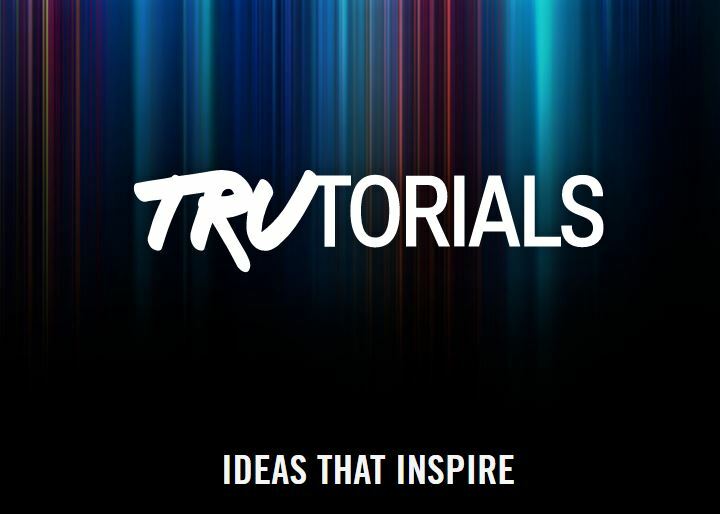 Native Instruments launches their new “Trutorials” series. Native Instruments have made public their first series of trick, tips and guides to their ever popular “Komplete” software. You can check out 12 different quick guides now with tips and tricks for Reaktor, Form, FM8, Replika XT, Rounds, Guitar Rig, Massive, Polyplex, Absynth and more. These are essential tips and tricks for any and all of you Komplete owners out there. “Many people have asked us to revive synth jewels from the past and make them affordable so everyone can own one. This very much resonates with me because when I was a kid, I spent hours in stores playing and admiring those synths – however I couldn’t afford them which was tremendously frustrating. I actually see a lot of merit in this and hot on the heels of the success of the Deepmind12 I see no reason why the company shouldn’t use the engineer talent from MIDAS for every good use they can possibly think of. I highly doubt with that level of talent on-board that they will settle for simple clones, the Juno 106 clone that slowly transformed into the DM12 is a prime example of this train of thought. Anyway, I digress. On one hand we have a group of people who think that this behaviour is total sacrilege. More so coming from Uli’s company who have the manufacturing facilities and buying power to make this cheap Model D a reality. Certain commenters have been quite vocal about this being a case of big B throwing a serious spanner in the works for the smaller boutique companies who simply cannot compete in terms of buying power and manufacturing cost – especially as Moog have reissued the Model D recently themselves. On the other hand we have struggling musicians and those who don’t care what badge a piece of gear has, as long as it sounds good and they can afford it then its a win-win. After all the posturing and proverbial mud slinging, Uli posted a gorgeous little render of a Eurorack compatible Model D clone…and with it the internet fire seemed to be suffocated by the lack of oxygen due to the communal gasps. Some of the staunchest naysayers on the thread seemed to relax a little once Uli revealed it wasn’t going to be just a cheap 1:1 clone. Among the ashes of the weeks bickering and moderated comments, there were posts that say Behringer may have plans for another 20 synths. Wait, what?! We are currently trying to acquire an original unit for benchmark purposes. We hope we will be able to show you a first design draft within the next few weeks, while we’re studying the circuit diagrams to provide you with an estimated retail price. Considering I’m not rolling in dosh, I have never had the opportunity to play on any of these mythical beasts, and his projected price range is much more suitable for someone like myself. I personally don’t see these units taking any market share away from the likes of Moog as they are aimed at completely different price points and completely different customer bases that very rarely venture into each others gear territory. 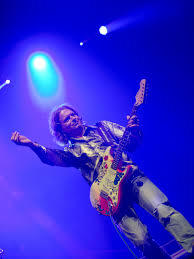 Uli Behringer I salute you! For more info be sure to head over to the Gearslutz forums, unfortunately some of the more colourful posts have been moderated but these threads are still a fantastic read. If this little article has got your synth buds salivating, why not take a look at the oscillating goodness we have in store! Ryzen is finally with us and it is quite possibly one of the most anticipated chipset launches in years, with initial reports and leaked benchmarks tending to show the whole platform in very favourable light. However when it comes to pro audio handling we tend to have different concerns over performance requirements, than tends to be outlined and covered by more regular computer industry testing. So having now had a chance to sit and work with an AMD 1700X for a week or so, we’ve had the chance to put this brand new tech through some more audio-centric benchmarking, and today we’ll take a first look at this new tech and see if its right for the studio. AMD has developed a whole new platform with the focus based around improving low level performance and raising the “IPC” or Instructions per clock cycle figure. As ever they have been keen to keep it affordable with certain choices having been made to keep it competitive, and to some extent these are the right choices for a lot of users. The chipset gives us DDR4 memory but unlike the X99 platform restricts us to dual channel RAM configurations and a maximum of 64GB across the 4 RAM slots which may limit its appeal for heavyweight VSL users. The is a single M.2. connection option for a high speed NVMe drive and 32 lanes for the PCIe connections, so the competing X99 solutions still offer us more scope here, although for the average audio system the restrictions above may offer little to no real downsides at least from a configuration requirements point of view. One thing missing from the specification however that has an obvious impact in the studio is the lack of Thunderbolt support. Thunderbolt solutions require BIOS level and physical board level support in the shape of the data communication header found on Intel boards, and Thunderbolt itself is an Intel developed standard along with Apple backing. Without either of those companies appearing to be keen to licence it up front, we’re unlikely to see Thunderbolt at launch although the little to say that this couldn’t change in later generations, if the right agreements can be worked out between the firms involved. Early testing with the drivers available to us have so far proven to be quite robust, with stability being great for what is essentially a first generation release of a new chipset platform. We have seen a few interface issues regarding older USB 2 interfaces and USB 3 headers on the board, although the USB 3 headers we’ve seen are running the Microsoft USB3 drivers, which admittedly have had a few issues over on the Intel boards with certain older USB 2 only interfaces so this looks to be constant between both platforms. Where we’ve seen issues on the Intel side, we’re also seeing issues on the AMD side, so we can’t level this as being an issue with the chipset and may prove to be something that the audio interface guys can fix with either a driver or firmware update. Overclocking has been limited in our initial testing phase, mainly due to a lack of tools. Current windows testing software is having a hard time with temperature monitoring during our test period, with none of the tools we had available being able to report the temps. This of course is something that will no doubt resolve itself as everyone updates their software over the next few weeks, but until then we tried to play it safe when pushing the clocks up on this initial batch. We managed to boost our test 1700X up a few notches to around the level of the 1800X in the basic testing we carried out, but taking it further lead to an unstable test bench. No doubt this will improve after launch as the initial silicon yields improve and having not seen a 1800X as yet, that may still proved to be the cherry picked option in the range when it comes to overclocking. One of the interesting early reports that appeared right before launch was the CPUid benchmark result which suggests that this may shape up to be one of the best performing multi-core consumer grade chips. We set out to replicate this test here and the result of it does indeed look very promising on the surface. We follow this up with a Geekbench 4 test, which itself is well trusted as a cross platform CPU benchmark and in the single core performance reflects the results seen in the previous test with it placing just behind the i7 7700K in the results chart. 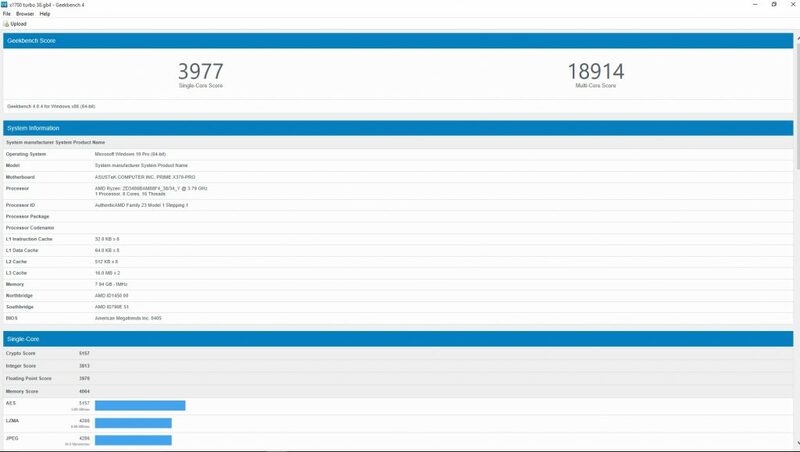 The multi-core this time around whilst strong looks to be sat behind the 6900K and in this instance sitting under the 6800K and above the 7700K. So moving on to our more audio-centric benchmarks and our standard Dawbench test is first up. Designed to load test the CPU itself, we find ourselves here stacking plugin instances in order to establish the chips against a set of baseline level results. The AMD proves itself strongly in this test, placing mid-way between the cost equivalent 6 core Intel 6800K and far more expensive 6900K 8 core. With the AMD 1700X offering us 8 physical cores along with threading on top to take us to a virtual 16 cores, this at first glance looks to be where we would expect it to be with the hardware on offer, but at a very keen price point. I wanted to try a few more real world comparisons here so first up I’ve taken the Dawbench test and restricted it to 20 channels of plugins. I’ve then applied this test over each of the CPUs we have on test, with the results appearing under the “Reaper” heading on the chart below. The 1700X stands up well against the i7 7700k but doesn’t quite manage to match up with Intel chips in this instance. In a test like this where we’re not stressing the CPU itself or trying to overload the available bandwidth, the advantages in the low level microarchitecture tend to come to the fore and in this instance the two Intel chips based around the same platform perform roughly in line with each other, although in this test we’re not taking into account the extra bandwidth on offer with the 6900K edition. Also on the same chart we see two other test results with one being the 8 Good Reasons demo from Cubase 8 and we tried running it across the available CPUs to gain a comparison in a more real world project. In this instance the results come back fairly level across the two high end Intel CPU’s and the AMD 1700X. The 4 core mid-range i7 scores poor here, but this is expected with the obvious lack of a physical cores hampering the project playback load. We also ran the “These Arms” Sonar demo and replicated the test process again. This tests results are a bit more erratic this time around, with a certain emphasis looking to be placed on the single core score as well as the overall multi core score. 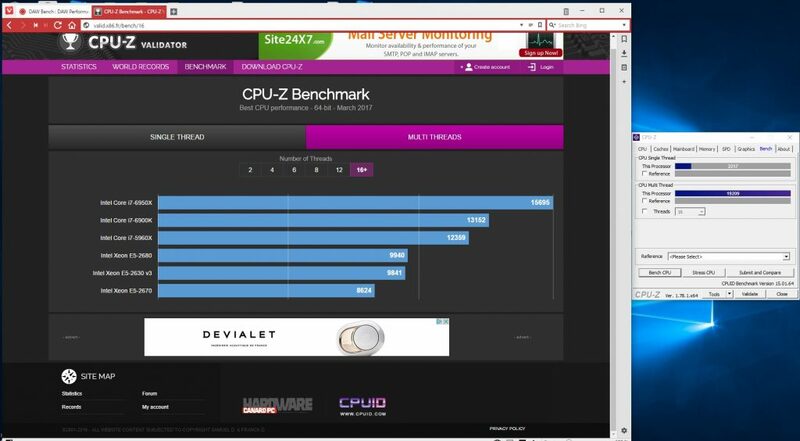 This is the first time we see the 1700X falling behind the Intel results. In other testing we’ve done along the way in other segments we’ve seen some of the video rendering packages and even some games exhibiting some CPU based performance oddness that has looked out of the ordinary. Obviously we have a concern here that the might be a weakness that needs to be addressed when it comes to overall audio system performance, so with this result in mind we decided to dig deeper. To do so we’ve made use of the DAWBench Vi test, which builds upon the basic test in DAWBench standard, and allows us to stack multiple layers of Kontakt based instruments on top of it. With this test, not only are we place a heavy load on the CPU, but we’re also stressing the sub-system and seeing how capable it is at quickly handling large complex data loads. This gave us the results found in the chart above and this starts to shine some light on the concerns that we have. In this instance the AMD 1700X under-performs all of the Intel chips at lower buffer rates. it does scale up steadily however, so this looks to be an issue with how quickly it can process the contents of a buffer load. Well the other relevant information to flesh out the chart above is just how much CPU load was being used when the audio started to break up in playback. Intel at this buffer setting looks to be hitting 85% or higher, so whilst the AMD chip may have more RAW performance to hand, the responsiveness of the rest of the architecture appears to be letting it down. 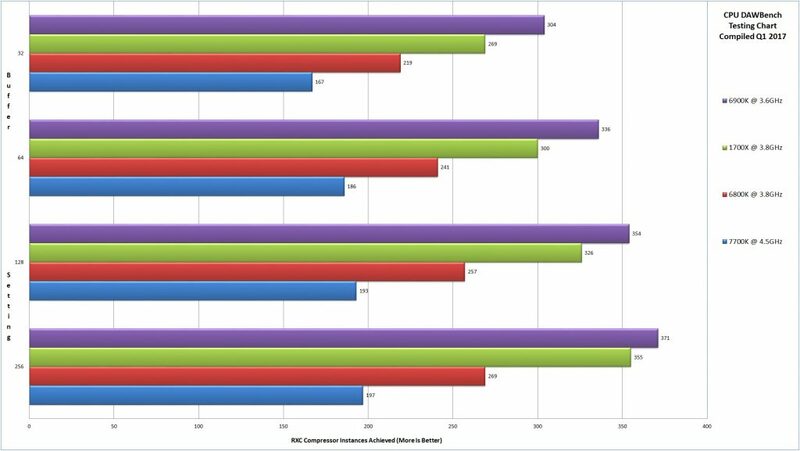 It’s no big secret looking over the early reviews that whilst AMD has made some amazing gains with the IPC rates this generation they still appear to be lagging slightly behind Intel in this performance metric. So the results start to outline this as one of the key weaknesses in the Ryzen configuration, with it becoming quite apparent that the are bottle necks elsewhere in the architecture that are coming into play beyond the new CPU’s. 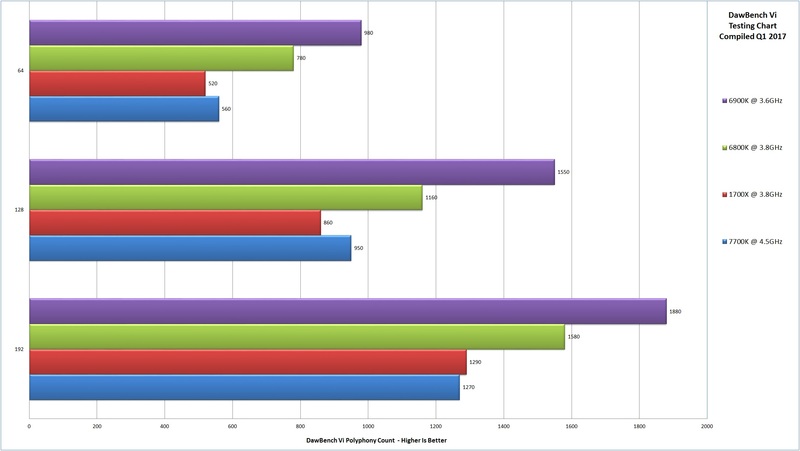 At the lower buffer settings the test tends to benefit single core performance, with the Intel chips taking a solid lead. As you slacken off the buffer itself, more cores become the better option as the system is able to spread the load but even then it isn’t until we hit a 192 buffer setting on the ASIO drivers that the performance catches up to the intel 4 Core CPU. 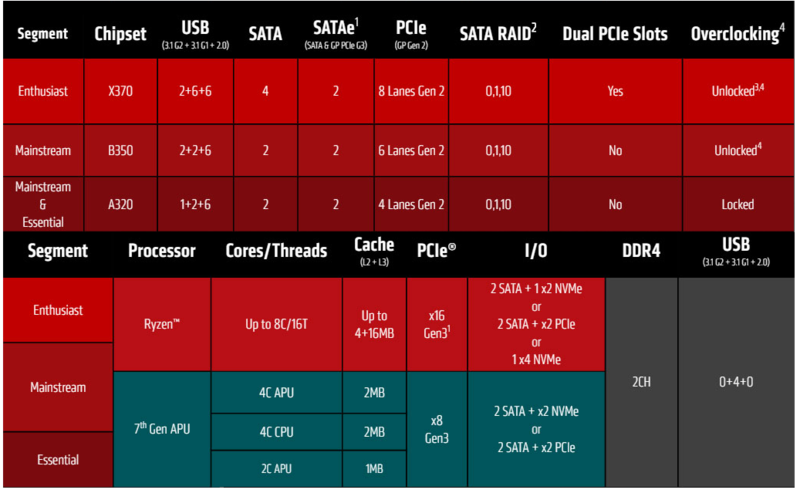 This appears to be one section where the AMD performance still seems to be lacking compared with the Intel family be that due to hardware bottle necks or still not quite having caught up in the overall IPC handling at the chipset level. What we also see is the performance start to catch up with intel again as the buffer is relaxed, so it’s clear that a certain amount of performance is still there to be had, but the system just can’t access it quickly enough when placed under heavy complex loads. What we can safely say having taken this look at the Ryzen platform, is that across the tests we’ve carried out so far that the AMD platform has made some serious gains with this generation. Indeed the is no denying that the is going to be more than a few scenarios where the AMD hardware is able to compete and will beat the competition. However with the bottlenecks we’ve seen concerning load balancing of complex audio chains, the is a lot of concern here that it simply won’t offer the required bang per buck for a dedicated studio PC. As the silicon continues to be refined and the chip-set and drivers are fine-tuned then we should see the whole platform continue to move from strength to strength, but at this stage until more is known about those strength and weaknesses of the hardware, you should be aware that it has both its pros and cons to consider.